I’ll bet that not even in the mythical Mayberry did they have a Boo Bash like we did last Saturday night in Milford. This annual event has become a real favorite with families that have small children. The downtown is closed off and all of the merchants sit in their doorways giving out candy to the kids in their Halloween outfits as they pass by. It’s just too cute and now draws quite a crowd to the downtown. Next up for the downtown is the Big Reveal – the unveiling of the downtown stores annual Christmas displays. Store windows will be covered with holiday wrapping paper soon as the merchants put together special window displays for the holidays. Then, on November 15th at 6:30 pm kids are invited to help the merchants reveal their windows by ripping down the paper. The downtown will soon be all decorated and lit up for the holiday season and parking meters will be bagged (don’t have to pay) from November 21 through January 2. The final big Milford parade downtown for 2012 will be the annual Christmas Parade, which takes place the Saturday after Thanksgiving – Nov. 25th this year. There’ll be floats and bands and groups marching in the parade and Santa will be there too! Plan on bringing the entire family to Milford for that event and then stay and enjoy our wonderful shops and restaurants. On November 29 the downtown merchants will be holding a Christmas Open House with strolling entertainment, refreshments and special sales. Santa will officially set up shop in Milford at 6 pm and start talking to kids about what they want for Christmas. If you bring a can of food to donate for the hungry, you can exchange it for a candle in Ceter Street Park and there will even be horse-drawn carriage rides available through the downtown area. Mayberry was a quaint little town on TV which I often refer to as a comparison to Milford; but they just couldn’t hold a candle to all of the events and family activities that go on in Milford each year. Life was quaint but somewhat dull in Mayberry. Life is anything but dull in Milford; and that’s great, especially if you have small children who are always asking what there is to do next. Come on out to Milford, there’s always something to do. The Pettibone Creek Powerhouse is perhaps the only venue in the Village of Milford that’s harder to get to see than the Museum, so persistence isi n order. The museum is open two days a week for about 8 months of the year, but the Powerhouse is currently only open on special events and about 10-12 times total all year long. Hopefully that will change in the not too distant future and the Powerhouse will become more available for the citizens of the Village. The Pettibone Creek Powerhouse is located in the north side of Central park, between the baseball field and the upper level parking lot. You can park in the upper lot and walk over or you can get to it off West Liberty St (which runs east and west off Cabinet St) and park in front of the building. That’s just about as close as you’ll get currently, since it is fenced off to prevent vandalism. It’s also fenced to prevent people from falling into the little waterfalls next to the Powerhouse, where the mill pond spills into a short creek run leading to the Huron River. Henry Ford had the Powerhouse built in 1939 to provide electricity to the Ford Carburetor Plant in Milford. That plant was a part of his “Village Industries” initiative of that era. You can read more about the era and the Powerhouse itself at the Milford Historical Society Web site or at the site that the Friends of the Powerhouse have set up. The facility is known by several names. The Milford Historical Society uses the name Pettibone Creek Powerhouse because the the water source for the generation of power is actually Lower Pettibone Lake to the north of the Village. A 48” diameter ½” thick pipe runs under the north side of Milford delivering water to the powerhouse. It does not take water from the mill pond right next to it. When Henry Ford was building the various plants and infrastructure for them he often used a Detroit friend and architect Albert Kahn to design the buildings. 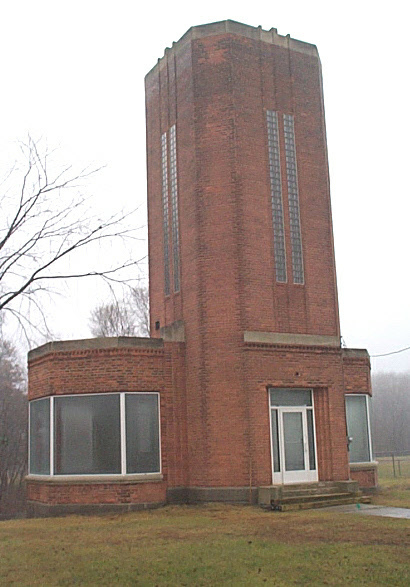 The Pettibone Creek Powerhouse is an Albert Kahn design. The Village of Milford had designated the building to be demolished when the Milford Historical Society stepped in and requested that they be allowed to save and restore it. A multi-year project, involving several grants and lots of local fund-raising resulted to the complete restoration of the exterior of the building and the cleanup of the interior. While the interior no longer has the turbines and control equipment that once generated power for the Ford plant, it is interesting to tour and you can still see the Lower Pettibone Lake water coursing thought the turbine housings. Currently, a group has formed and preliminary work has been done to see if the Powerhouse can once again be made to generate power. Engineering feasibility studies have identified the types of new turbines that would be required, the flow rate and power generation rates that could be sustained and have explored the economics of the venture. It is estimated that the old Pettibone Creek Powerhouse, if refitted to generate power could generate enough power to supply the majority of the power required to operate Milford’s municipal water pumping, with the excess to be sold back into the power grid. It’s an exciting prospect that has a lot of local people pulling for it. If you’d like to schedule a group through to see the Powerhouse or you’re interested in supporting the work to get the Powerhouse generating power again, contact Rich Harrison at 248-935-5556. If you’d like an idea about what you’ll see, there is a virtual tour at the Powerhouse Web site. Click here to view that tour. When is it a valid short sale? I own and operate a web site called MIShort Sales.net which one can get to using .net or .com at the end. It is an informational site that explains the short sale process and hopefully answers a bunch of common questions. It has lots of links to very good articles on various topics, such as the impact on your credit of a short sale and comparisons of the consequences of a short sale vs. a foreclosure vs. a bankruptcy. It also gives the reader a good idea of the timeline and processes that one must expect to go through in order to do a short sale. One of the key ideas behind the short sale process is that of the “hardship” that the homeowner faces that has caused the need to sell. There are many valid reasons that will justify the lender granting the mortgage holder relief – a layoff, illness, divorce, and more. All of them somehow point back to a loss of income by one or both of the homeowners involved. I get those stories of life’s travails all the time. You can read a more complete list of justifiable reasons for a short sale at the web site. Something as common as a loss of overtime at work can become a hardship justification. I also get a lot of calls from people who have already made other life decisions to move on, whether that was required or not, and who now just don’t want to continue paying for the mortgage on the old homestead that they’ve left. Some are retirees who’ve moved to their retirement home (usually in some warm clime) and just don’t want to keep paying for their old home. Some are people who’ve accepted new jobs somewhere else and moved, initially renting out the old home because they were underwater on it. Now they’ve tired of the whole absentee landlord routine and perhaps the monthly drain that the old home still has on their finances. They have very marginal cases (if any) for justifying a short sale. In many cases they have already been turned down for a short sale by their lenders. In those cases, I have the would-be sellers talk to my short sale partners at Nationwide Loan Help. I don’t do the lender negotiation and legal side of the short sale, that’s what I use Nationwide for. They have a staff of negotiators and more importantly they have lawyers on staff. It’s my feeling (and the feeling of my company’s legal counsel) that short sale negotiations quite often cross into the territory of giving legal advice, which I am not qualified to render. It may well be that trying to negotiate a deed-in-lieu is the best path for some of those homeowners; or it may just be that they need to find a way to bring some money to closing. They really need to look at whether they are in a “I don’t want to” or “I can’t afford to” situation. We can explore the” I can’t afford to” cases for possible hardship justification. The “I don’t want to” situation just isn’t going to get any sympathy from the lender or from us. So, before you call about a shot sale, go read the material at the MI Short Sales Web site and take a good honest look at your situation. If life has dealt you an unexpected blow that has really left you unable to continue to make your payments, give us a call. I can help you. However, if you’ve made conscious decisions to move on and abandon your obligations, because it just isn’t convenient to keep paying anymore, I probably can’t help. Call your attorney and your financial advisor and get ready for the credit impact of a foreclosure. I think of lots of little things that I find amusing or interesting, but which wouldn’t, in and of themselves, justify a blog post. So, today I collected a bunch of them under the heading of a bit of this and that. Two people now passed that I enjoyed were Andy Rooney and George Carlin. Both had fun with words and our language. Andy used to go off on those “Did you ever notice…” riffs and George could make a single word the subject of 3-5 minutes of a comedy routine, although later in his career he seemed obsessed with just dirty words. So, recently I was having sort of and Andy & George moment and I wondered how does one re-gruntle someone who has become disgruntled? I mean you can work with someone who has become disenchanted and perhaps re-enchant them, maybe on some enchanted evening; perhaps when you see a stranger; but what do you do with a disgruntled person to re-gruntle them? And did you ever notice that you can help someone who is disorganized regain control and get some organization back in their lives; and often when someone becomes disoriented it just a matter of helping them stop and take a breath and think about where they are to help them reorient themselves. But, what of someone who becomes discombobulated? How does one go about re-combobulating that poor individual and how would one gauge when the combobulation process was done. Of course one wouldn’t just replace someone who had been displaced, because the original person might then become misplaced; but we won’t go there. Jack went on to write about not putting off your dreams until Someday. I’d probably add that although there’s no Someday on the calendar it does have tomorrows aplenty and we all have a tendency to put off until tomorrow what we should do today. Do you have dreams that you’d like to get to someday but keep putting off until tomorrow? We have a tequila bar in town – Tequilaritas – which has many different kinds of tequila on display and which features lots of special margarita drinks. I was there last week and got to thinking that, since I’m a senior they ought to have a margarita that is specially made for seniors. So I suggest the AARP-a-rita. Down a couple of these and you’ll be happy, healthy and regular again, with no worries about heartburn later. Finally, there’s been an ad running on TV lately for one of those testosterone replacement products for men, the kind where they ward women and especially women who may become pregnant not to touch the area where the product is applied, because it might cause unwanted hair to grow on the person doing the touching or cause other bad health problems. The ad ends with a slow pan from the waist up of the actress who is playing the wife of the man, who has applied the product; who is now shown in the background as the epitome of a viral male. I always think when I see that ad that it would be a hoot to see a bearded lady when the camera pans up. Well, oops! “An error doesn’t become a mistake until you refuse to correct it.”- Orlando A. Battista 1917 -1995, Canadian-American Chemist and Author. I saw that quote in a post on ActiveRain.com, one of the real estate sites that I frequent and have a blog on. I’d probably add that you first have to acknowledge the error, which all too many of us have problems doing in the first place. You can’t move on to the correcting (or not) stage unless you first come to grips that you have made an error. In fact, it’s probably the refusal to admit the error that really turns it into a mistake. The refusal to correct the error just compounds the mistake. It is human nature to have some trouble admitting to an error. Sometimes that can be as simple (and as obvious) as going in the wrong direction when trying to get somewhere. Of course, if you’re a man, admitting that you are lost and stopping to ask for directions is very hard. Another obvious error is “finishing” the assembly of something only to find that you still have some parts left over. Oops! Sometimes the error may be very difficult to recognize. That happens a lot when human feelings are involved. Maybe the error was just a remark dropped innocently into a conversation. Maybe that remark was meant as a joke but wasn’t politically correct. It’s easy to miss that slight pause in the conversation or the flush on someone’s face as they react to something that you just said, but many times you’ll sense it. You may not understand why something you said caused the reaction from the listener. It’s not always easy to figure out in the midst of the conversation how to recover or to correct the error. You may have to ask someone else, later, in order to find out what it is that you might have said that offended or caused the person that you were speaking with to react. Many times you’ll find that you’ve inadvertently hit a nerve that is still raw from some traumatic event in that person’s life, like a death or divorce or perhaps there are family things that you’ve somehow been insensitive to, like a having an autistic or special needs child in the family. The key is not to let that error become a mistake, by refusing to acknowledge it and not trying to correct it. It may be hard to go back to someone with whom you had a conversation and made some remark that you later found was probably offensive or insensitive from their perspective; but it is important to do so. Otherwise they will forever have this little flag that says “jerk” in the back of their minds that is raised whenever they see you. Don’t let your error turn into an uncorrected mistake. You’ll feel better and so will they. “If you don’t get everything you want, think of the things that you don’t get that you don’t want.” (Oscar Wilde) – from the Jack’s Winning Words blog. I’ll bet that most people reading this saying would immediately think of bad things that they don’t want, such and a disease or some disaster; yet there are many things in life that aren’t bad , but which are just things that we don’t want. At one time I thought that I wanted a motorcycle; but then I realized that I really don’t; it was just fun to think about for a while. I suspect that most of us would immediately think of material things when reading a saying like the one above; although some with lingering illnesses might just wish for good health. Some might even have wished for world peace, but might have to be happy if we don’t get another war in some far-flung place. The most common advice for what to do about not getting everything that you want is to be thankful for those things that you do have. You could also think about all of the things that you wanted and got that it turns out you don’t use or found that you really didn’t like. Our garages and basements are full of that kind of stuff. Wilde didn’t include need in his thought. It’s relatively easy to just say “don’t waste time thinking about stuff that you can’t have”; but we all waste a little time doing that. Perhaps Oscar Wilde’s advice to spend time thinking instead about stuff that you don’t want anyway will work to distract us from dwelling on things that we don’t have. That we wanted. And, if you just don’t get all of this, perhaps it’s because you just don’t want to. You are currently browsing the NormsMilfordBlog blog archives for October, 2012.